← 25 Small, Sustainable House Plans eBook Now Available! “Jaime Marin describes his experiment with building an earthbag root cellar in Belize. Using the most cost effective resources available at hand to develop a minimalistic but effective source of shelter and infrastructure for this transitional home project for children at Barzakh Falah in Georgeville, Belize. The project uses volunteer labor as it gets closer and closer to completion and minimal funds solely for materials. You will not find any embellishments to their buildings but the focus is more on erecting functional structures that will receive their own personalization as time goes on by the inhabitants it will serve. This is totally a local initiative and much thanks is given to all the earthbag community out there. This is a little we can give back of what we’ve learned thanks to all of you in the hopes it will help others in return. Also thanks to all the wonderful volunteers who have literally poured their grain of sand into bringing us this far. The video provides an overview of the building process including details on the foundation, bagging process, architectural support, and useful tools of the trade. Stay tuned as the building process goes on as the two story tower rises above ground. Some new earthbag techniques include using cinder blocks mortored in place for doors and window frames. T-beam roofs with parapets. For more information on the project please contact Jaime Marin at jnoelmarin@gmail.com. Note: I shared my concerns about completing the root cellar before the rainy season, and the importance of keeping water away from the foundation. He’s well aware of the issues and doing a good job. I desperately would like to see the insides of the existing EB buildings there. I love the vines. I wonder if they could possibly pose any structural threat? I know they are very invasive and as tenacious as a two year old. I’ve asked about building in Belize – there’s little information because there’s a lot of focus on areas more susceptible to earthquakes than there is about areas of tropical/subtropical climates so this absolutely piques my interest. Would a root cellar last/work here? Would the domed roofs be okay in such harsh conditions? With the humidity and the rains? How often would the lime plaster need to be redone? I’d love to find this man and pick his brain! 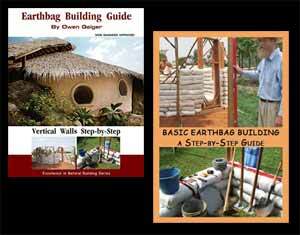 Lots of people are building with earthbags in tropical climates. No problems reported so far. Just be sure to take common sense steps to avoid water damage (build on high ground, build a good roof with wide overhangs, etc.). Vines will penetrate any little crack in the plaster and in turn create larger openings for water penetration. You may not notice the water damage until it gets bad. Plus, vines make it very difficult to replaster. For these reasons I wouldn’t use vines on high value structures. They’ll probably send an update before too long. Thanks for the response, Mr. Geiger. Weird, I didn’t get a notification. Yeah I thought the same thing about vines re water damage but I wondered about living roofs..I’m really torn on the best kind of roof to use because I seem to recall reading somewhere (I believe on your site?) that using round roofs or domes in humid/rainy climates would be inadvisable so now we’re laboring over alternatives that stay true to eco-friendly ideas. Any shape or type of regular roof is fine. It’s just domes that are vulnerable in rainy climates because they don’t have roofs.